Hi everyone! 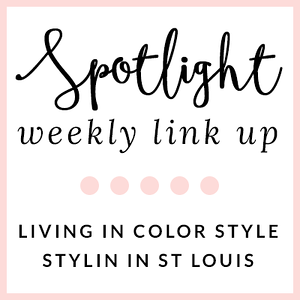 This week is our spotlight weekly theme is statement jewelry! I love a good statement necklace and this one is one of my favorites! Come share your statement jewelry looks with Elle and I! 1. 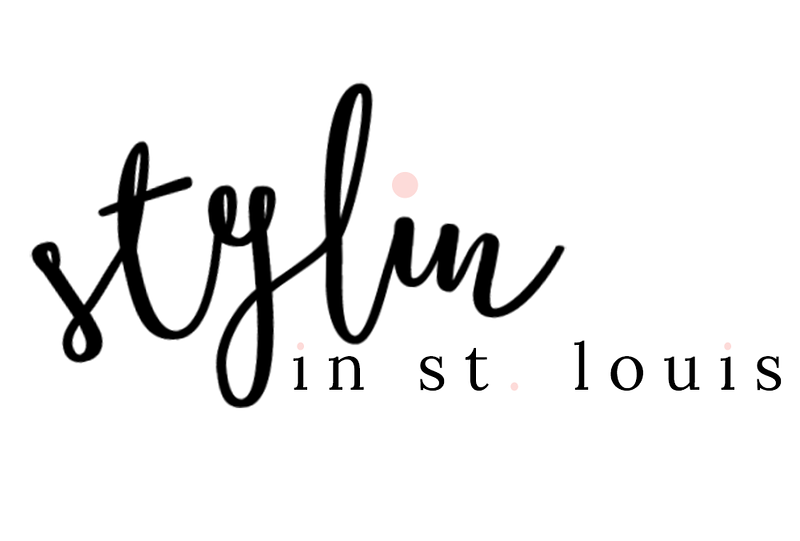 We kindly ask that you follow the two hosts: Elle from Living in Color Style and Jacqueline from Stylin' In St. Louis via Bloglovin or GFC and of course our co-host Steph of White Coat Wardrobe. 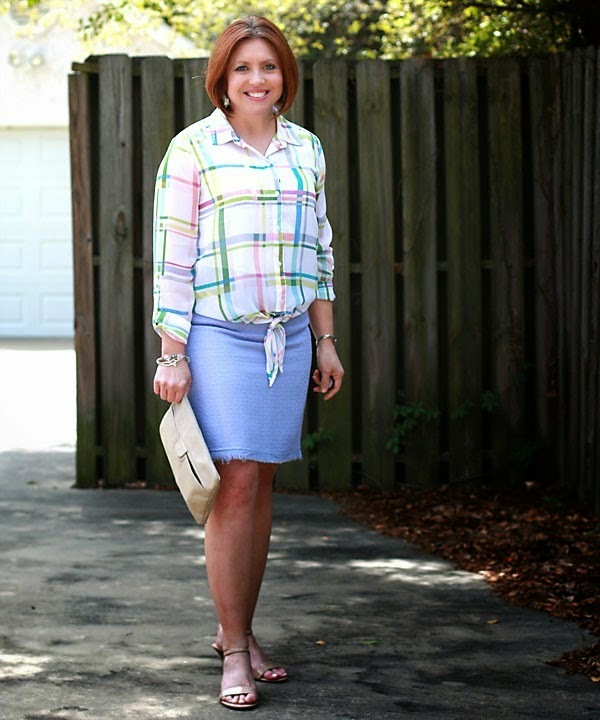 Spotlight: Our spotlight this week is Fonda of Savvy Southern Chic! We just adore Fonda's spring look! Her plaid top looks great with her skirt! Be sure to check out her blog! 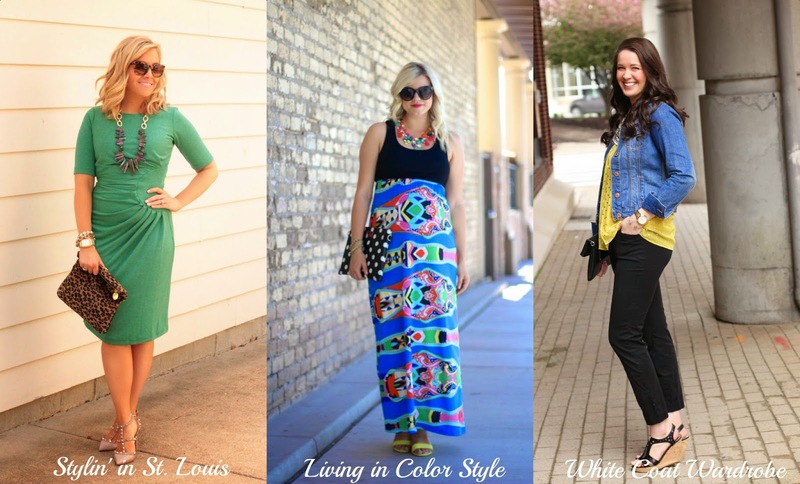 Next week: Next week our spotlight weekly theme is work style! Thanks for linking up! See you next week! love love love it! you look stunning! the dress is perfect! fits perfectly! head to toe stunning! That Shabby Apple Dress is Stunning, WOW! And I love that fun, unique Statement Necklace. This is one of your very best looks. Now I want that dress also. It comes in 3 amazing colors, too. Love Steph's Style too. She always looks so put-together. Thanks for another great link-up! you look stunning in green, love that dress on you. This green dress is gorgeous on you and I love that necklace!! Love the shoes & necklace! Stop by my link up if you get a chance. Beautiful! Such a ladylike and elegant dress! Classy lady. Loving this green dress on you, beautiful!!! Love that necklace, girlfriend! And green is so pretty on you! That is a fabulous necklace! Love that green dress on you! That necklace is so pretty but those V shoes are equally rocking!! Such a pretty necklace! I love how it compliments your green. I am wearing my first Rocksbox set in the post I linked. It is amazing how jewelry can impact an outfit. I like the statement necklace (of course!) but what really grabs me about this is THAT DRESS!! That is such a unique colour of green and as a blonde I never would have thought I could wear something like that but it looks SO stunning on you, that I may just need to try it out!! This dress is stunning on you!!! The color is beautiful and that necklace is such a great touch to it. The dress is fabulous and you look stunning! Love those heels too-- Are they comfortable? The cute of that dress looks amazing on you! I love the necklace, too! I have no words for those shoes, they are simply stunning! You are seriously rockin this look! I'm in love (of course) with those shoes..
Green is your color and those shoes go beautifully with that dress! That dress looks amazing on you - what a great piece! I really love those shoes! I am a sucker for studded heels! Green is your color girl! Gorgeous! I love the necklace and heels! Great outfit! I love the shape of your dress!